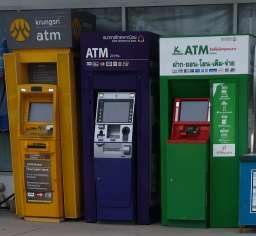 Private persons living in Thailand who open a bank account receive an account book (similar to a passbook) as well as an ATM-Card if necessary. An overdraft on the account is not possible. (Deposits Protection Act B.E. 2551) limit the amount of the guaranty with the use of a systematic tier approach onwards 1 Million THB protected. An account such as this makes account transactions possible in foreign currencies, e.g. USS, euro, CHF with a Thai bank. The staff of the bank branches are not usually in the position to given this specification information. The central bank is therefore the better partner. The conditions of the individual banks are quite different. An opening deposit of approx. 5000 USS is usually requested. A monthly account fee of 10 USS is not unusual. Thai banks do not have an IBAN identification number. You should therefore indicate the SWIFT-BIC code of the respective bank for transactions. Cirrus – As an account holder, you are entitled to a so-called ATM-Card. It makes access to automatic bank machines possible at all times. At the end of the month, you should expect long queues in front of the bank machines. These machines can even be empty at times. The use of the machines is relatively simple and the language can be changed into English. Therefore operating the machine should not represent a problem. The disbursement amount is depending upon Card type on Maestro 20,000 and/or. 40,000 Baht for each day, as well as a monthly maximum amount limits. Additionally, if the card has a “Cirrus” or “Maestro” logo, you can take money out of cash machines in your homeland. This of course also applies to European bank cards, which are provided with the Logos specified above, at Thai bank machines with the logos specified. In Thailand it is quite difficult for foreigners to receive a credit card from a Thai bank. The conditions for credit cards are usually less customer friendly in Thailand than in Europe. Even the Thai authority "for the protection of the consumers" requested to study the contracts very exactly. However, if you happen to still have an account in your homeland, there is the possibility that you apply for a credit card from this institution. The account statements are sent to Thailand. If the card expires, the new card is simply sent to Thailand. You can also take money from Thai bank machines which carry the Maestro or the Cirrus Logo. If you still maintain another account in your homeland, then the use of "Internet Banking" can be very helpful. Using the internet site of your bank, you have access to your bank account with your computer. It can be used to track transactions and find out the balance as well as for making transfers. For safety reasons, the pin number as well as TAN numbers, should not be stored under any circumstances on the PC. An international credit transfer is however, unfortunately not possible with internet banking at the moment. With the postal bank international Credit transfer is possible. In the meantime, most Thai banks also offer such a service. The efficiency level has not matched up to the standard common in Germany yet. To access the site an identification authorisation and password is needed. Safety precautions such as TAN numbers are, however, not usual. Online banking always presents a security risk. Always be sure to use security software (virus protection and firewalls) on your personal computer. Make sure that this software, as while as the operating system, is regularly maintained and updated in order to offer continuous protection. Keep in mind that using online banking from a PC other than your own (e.g. in an internet cafe) is always risky. In general, as with all things in life, a healthy scepticism should be exercised when using the Internet. If you have transferred larger amounts into Thailand, and you have therefore paid interest gains tax, it might be possible to get the tax back from the tax office. With the present high interest charges this is not particularly effective. Before the economic crisis this was completely different. In the search for a favourable fund investment some investors came across the idea to try their luck on the Thai Stock Exchange. This is only recommended to natural players or real insiders. Max. 50 000 Baht per person.